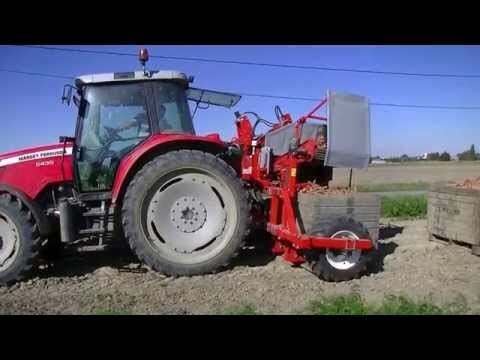 The P3CL Profi is a mounted 1-row top lifting harvester with hydraulic box lift. This makes the harvester ideally suited for unloading directly into boxes. The hydraulic box lift makes it incredibly easy to switch boxes. The accompanying support roller of the top lifting harvester is easily retractable, reducing the road transport width to just 3264 mm. With an optional sorting platform you can inspect the product, if desired. The keypad allows you to operate the cross conveyor, the lift system and the hydraulic fall breaker. The intuitive operating console makes working with a mounted top lifting harvester from Dewulf particularly enjoyable. The console was specially designed to enable the user to harvest a perfect product with a minimum of operations. Pictograms make it easy to see which function is available and ready for use. The operating console communicates via CANBUS for the Profi models.